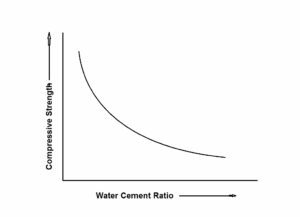 Water cement ratio can be defined as the ratio of the volume of water to the volume of cement used in a concrete mix. Water has a great role on the strength and workability of concrete. After lots of experiments it has been found that for a specific proportion of materials in a concrete mix, there is a certain amount of water that gives maximum strength. A slight change in the amount of water causes much more differences in the strength of concrete. If less water is used, the resultant concrete will be nearly dry, hard to place in the form and may create difficulties in compaction. Besides this, with less water proper setting will not be guaranteed and thus the strength of concrete get reduced considerably. On the other hand, if water is used more, it may develop larger voids and honey-combing in the set concrete, in this way decreasing its density, durability, and strength. Hence, water cement ratio attends an important role in producing concrete of required strength. The lower the ratio, the greater is the strength of concrete.